Can you believe the holidays are already here? As you prepare to go up into the attic and drag down those decorations, there are a few things you should consider. According to the U.S. Fire Administration, the number of open flame fires doubles during the holidays and property damage is more than one third greater than an average structure fire. While some fires are related to cooking, candles, and fireplaces; the majority of fires are electrical in nature. 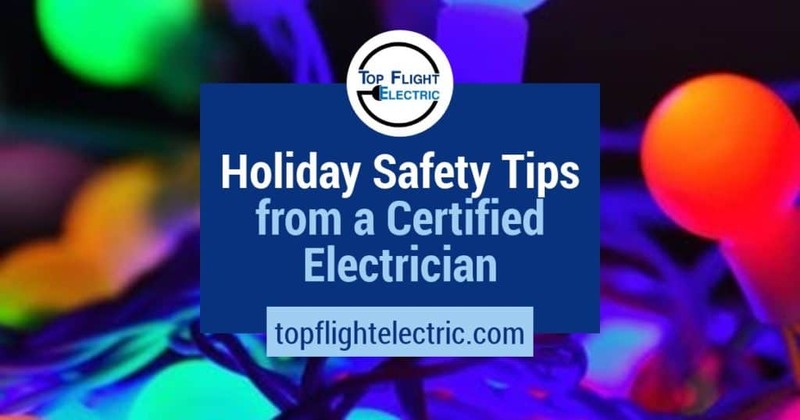 A certified electrician can spot trouble before it becomes a holiday disaster. Why is there not an outlet here? Invariably there is never an outlet where you need it when it comes to the perfect location for the Christmas tree. Stretching an extension cord can be unsafe! Hiring a licensed electrician to evaluate outlet location and installing additional outlets and/or relocating an outlet will help keep you and your family safe. Why will the plug not stay plugged in? Over the years, plugging and unplugging cords into an outlet can cause them to wear. This normal wear and tear eventually leads to the connection becoming loose and causing arcing in the outlet. Having your home electrical system inspected by a certified electrician to spot trouble before it happens will prevent a worn outlet from becoming a fire hazard this holiday season. Why does the breaker trip when I plug in my decorations? Overloading a circuit is dangerous! A licensed electrician should be called to evaluate the situation. Plugging too many decorations into an outlet will overload the circuit, resulting in the potential for a fire. A certified electrician can evaluate the situation and provide you the necessary equipment to prevent a dangerous condition. Oh no, the power is out! Colder weather and winter storms arrive with the possibility of power outages. Using candles for light and alternate methods of heating can result in unsafe situations. Contracting a licensed electrician to install an emergency generator from a certified Generac dealer can provide safe backup power to light and heat your home in the event of a power outage. Top Flight Electric is your local Generac dealer with licensed electricians ready to inspect your home for potential problems and advise you on the proper emergency generator to provide safe power in the event of an outage. Get your home ready for the holidays by scheduling an appointment with one of our certified electricians today!